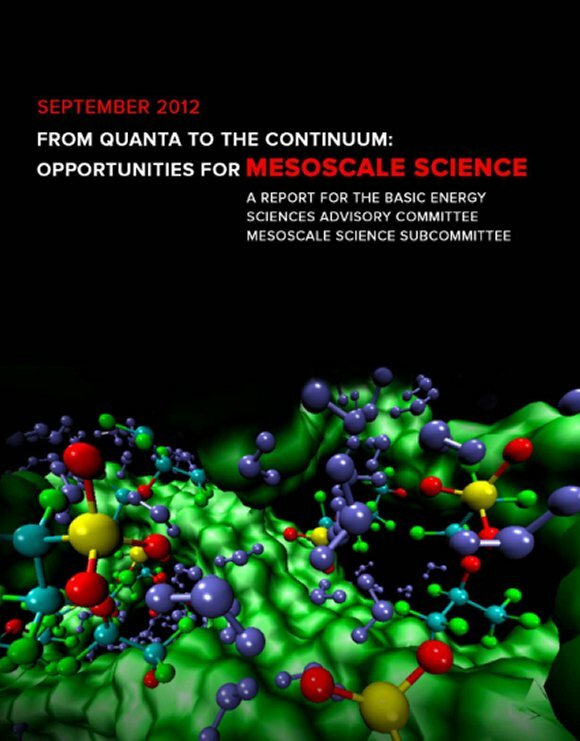 Research by Ram Devanathan and Michel Dupuis is featured on the cover of From Quanta to the Continuum: Opportunities for Mesoscale Science, a Department of Energy Basic Research Needs report. 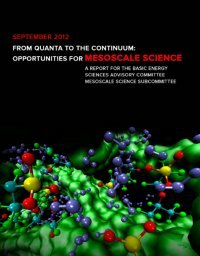 Congratulations to Dr. Ram Devanathan and Dr. Michel Dupuis at Pacific Northwest National Laboratory on having their work grace the cover of From Quanta to the Continuum: Opportunities for Mesoscale Science, a Basic Research Needs report. The Basic Energy Sciences Advisory Committee Mesoscale Science Subcommittee selected the image because it shows the atomic scale, nanoscale and mesoscale. The mesoscale is the scale between atoms and bulk materials. The image is a simulation of a separating membrane (green) with water molecules (purple) and acid groups (yellow and red). To control the membrane's selectivity, critical for energy technologies, scientists must understand how the membrane behaves on the mesoscale. The Basic Research Needs report, published by the Department of Energy September 2012, describes the state of the science and the research needed to overcome current roadblocks to widespread use of alternative energy technologies. For more information, see the mesoscale research website.